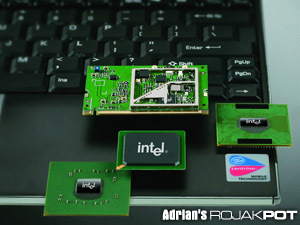 Team ARP was invited to attend the launch of Intel's new Centrino Mobile Technology, codename Sonoma on Wednesday, 19th January, 2005. Since everyone else could not make it, this rookie reporter was sent to cover the event! The new technology is said to be an improvement to the previous Centrino Mobile Technology, also known as the Banias Mobile platform launched almost 2 years ago, and the Dothan Pentium M processor launched about a year ago. I arrived at to the Top Hat restaurant on Jalan Kia Peng, after a short walk from KLCC. Press registration began at 10:00 a.m. and early birds were served light refreshments while we waited for the event to begin. The launch commenced at about 10:45 a.m with a welcome from Mr. Peter Choong, the Country Manager of Intel Electronics Malaysia. He is in charge of sales and marketing operations in Malaysia. 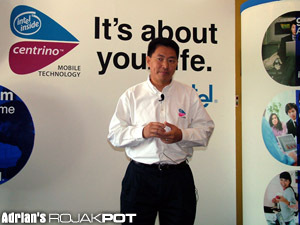 In his keynote address, he spoke of the additional features of the new Centrino Mobile Technology. But what caught my eye most was the DVD/CD player that did not require an Operating System, and the remote control that really makes it look like an Entertainment Unit. This, of course, only applied to the particular notebook that was being demonstrated but still, it is one heck of a feature! Peter Choong called it “The Ultimate Mobile Entertainment Unit”. He also added that, even with all the new and more advanced features, the battery life is about the same as its previous designs. Mr. Choong then spoke of the growth rate in sales, which is showing a rapid climb of 15% for professionals and 17% for consumers. In my opinion, the reason for the greater increase in the consumer market, compared to the professional market, is due to the fact that the new Centrino Mobile Technology caters more to home users and gamers, with its improved graphics and audio capabilities. After giving his speech, he took some questions. Someone asked if Banias and Dothan will be phased out, the answer was no. Then, there was a showcase of some of the systems running off the new Centrino Mobile Technology.